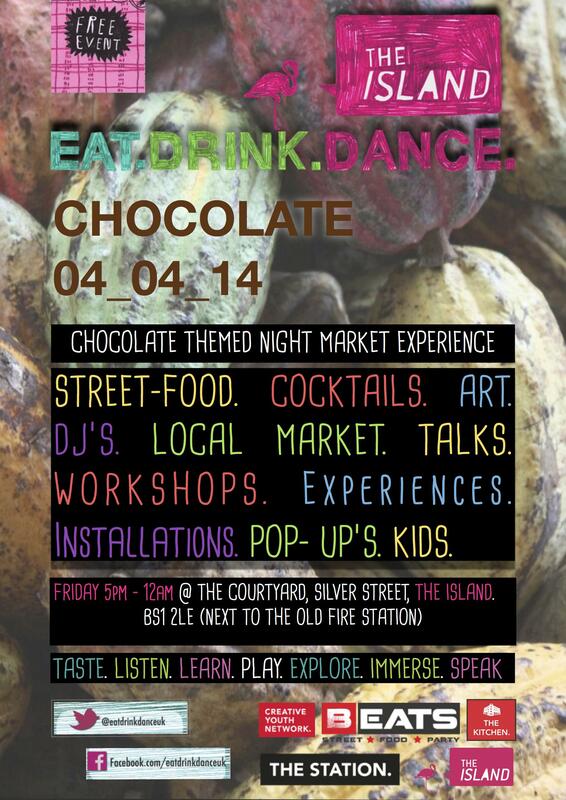 Some of you may have enjoyed the inaugural street food night market from Eat.Drink.Dance back in early December 2013…and the team are now back with their second event in association with The Island Bristol. Combining street-food, art, talks workshops, music and all things local, Eat.Drink.Dance is far more than just a night market. It’s a fully immersive experience: a regular social event taking over abandoned buildings or courtyards and bringing them alive not just with great food and drink but with local and independent traders, artists, experiences and musicians/DJ’s over one night, as an alternative way to get people out of their houses on a Friday night! 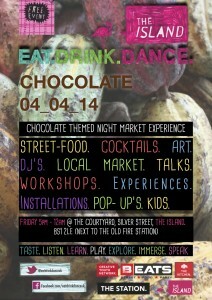 On April 4 from 5pm to midnight, head to The Island where you’ll be able to enjoy a chocolate-themed event, combining street food traders, chocolate treats, a Willy Wonka sound experience, an Easter egg hunt, a hot chocolate bar, local craft beer and cocktails, local crafts and arts, DJs, talks, workshops, a kids’ corner, a record shop, a fire pit and indoor seating…it’s going to be a busy evening! Street food vendors already confirmed for the evening include Vee Double Moo, ASIA POP!, Cauldron, Aztec Churros, The Kitchen, Rib Street, Eat Like A Greek and Stiw. You’ll also be able to enjoy chocolatey treats from traders including Dark Matters, Alchemy Tree, The Boy with the Chocolate Hands and Zara’s Chocolates, with others to be confirmed. Entry to the event is free, just be sure to bring some cash to enjoy the great selection of food, drink and more! For more information, visit the Eat. Drink.Dance Facebook page.